They are both in wheelchairs due to muscle dystrophy. Maria can use her one hand, but Donnah has to be fed. BACKGROUND: Zanele Maswanganyi is the youngest of three sisters who live together in Burgersdorp village, just outside Tzaneen. At 28-years old, she looks after her older sisters: Maria (41) and Donnah (35). They are both in wheelchairs due to muscular dystrophy. Maria can use her one hand, but Donnah has to be fed. In 2006, Zanele also started losing her muscle function, due to the same genetic illness. She can get by on crutches in and around the house but uses a wheelchair when she needs to walk longer distances - outside of the home. Her 11-year old son, Success helps around the home when he can but Zanele encourages him to focus on his school work. Nikiwe Phakula is part of a group that does outreach work in the community. She recently met Zanele and heard about her and her sisters’ situation. Nikiwe says she had sleepless nights trying to think of ways to help Zanele and her sisters. 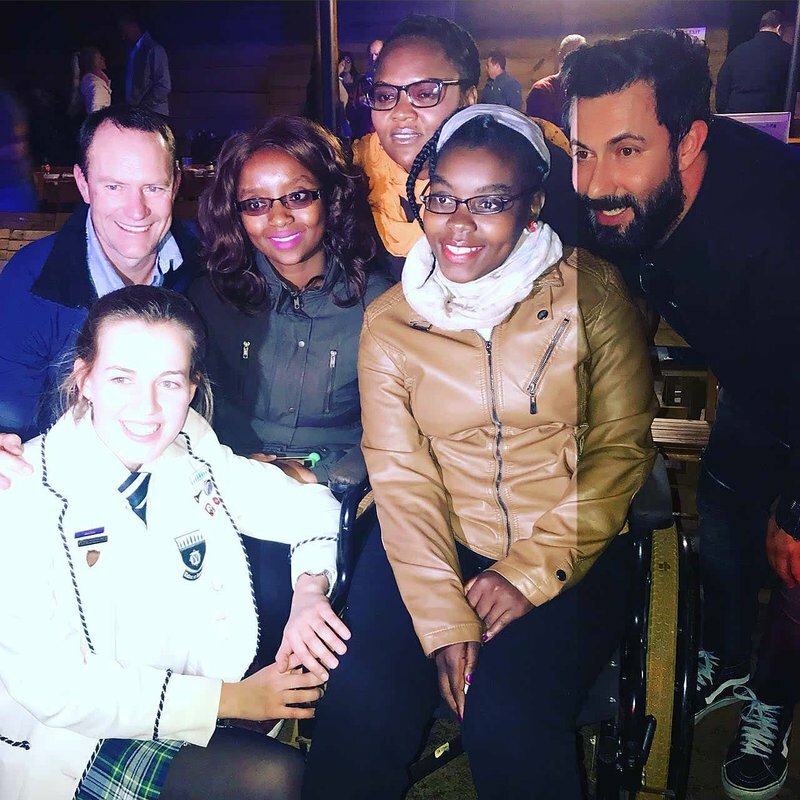 That’s when Nikiwe wrote to Good Morning Angels, asking for help for these sisters with a shower and ramp at home, to make it easier for them to get by - and an electric wheelchair for Zanele. SPONSORING: Elané, another five learners and two teachers from Stanford Lake College recently went on a ‘World Challenge Expedition’ to Nepal. They did a fundraiser and have R27 000 they will donate to Zanele and her sisters, to improve their mobility. SPONSORING: Mr. Anonymous added another R30 000 to make the total donation to Zanele and her sisters R70 000! Johan and his team assisted with transportation for Zanele and Nikiwe to and from the “Vir Die Liefde” consert. They will also assist Zanele when choosing a new wheelchair and co-ordinate the building project at her home. The Round Table also did the collection and distribution of blankets donated as entry to the concert! My name is Nikiwe Phakula from Tzaneen. I met Zanele Maswanganyi (28) two weeks ago in Burgersdorp village around Tzaneen where she stays. She uses crushes to move around her house but for distances more than 100 metres she uses a wheelchair. She was diagnosed with Muscle dystrophy. Her problem started in 2006. When she told me, her 2 sisters (Maria 41 and Donnah 35) are also wheelchair bound I felt shattered. She told me Maria can use her hands but Donnah needs to be fed. They have ordinary wheelchairs that needs a second person for them to move around , they can not do it on their own. And their house doesn't have a wheelchair ramp and bathing is a problem for them since they don't have a shower. Im humbly asking the angels to assist these sisters with battery operated wheelchairs if possible/ build them a ramp/ and shower. We are learners at Stanford Lake College, a private high school in Haenertsburg, Limpopo. We are a group of 6 learners and 2 staff members who recently went on a ‘World Challenge Expedition’ to Nepal. We had to do fundraising in order to fund a community project at a local school where we bought them supplies, renovated a classroom and build a wall around their playground. We still have R27 000,00 left which we would love to contribute to any case that needs help. Perhaps since we are learners maybe we could help other learners? But any case would be great. If you would be able to give us more information on a particular cause we could sponsor, we can even ask our school to perhaps contribute money which could be added to the R27000,00.